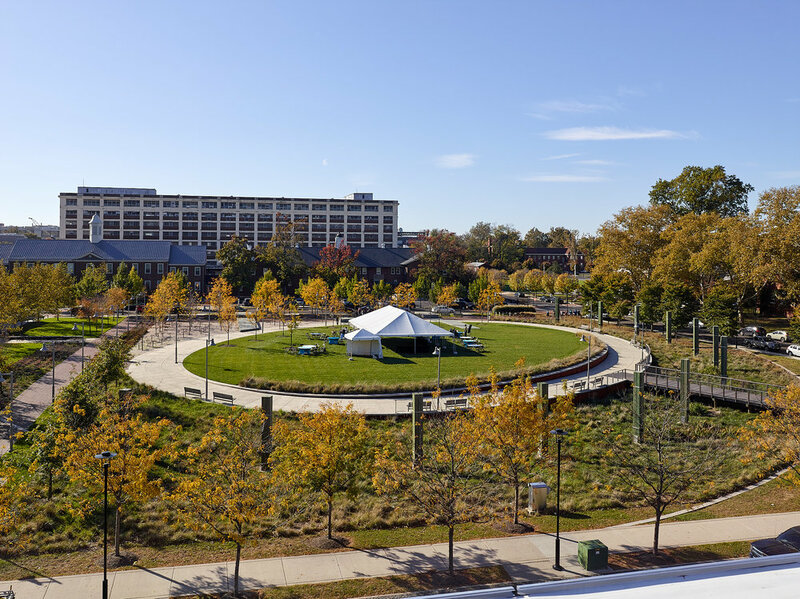 Crescent Park, at the terminus of Broad Street, fulfills the vision of a master plan initiated by the Philadelphia Industrial Development Corporation to create a memorable entrance to the 21st century reincarnation of the decommissioned Navy Yard. 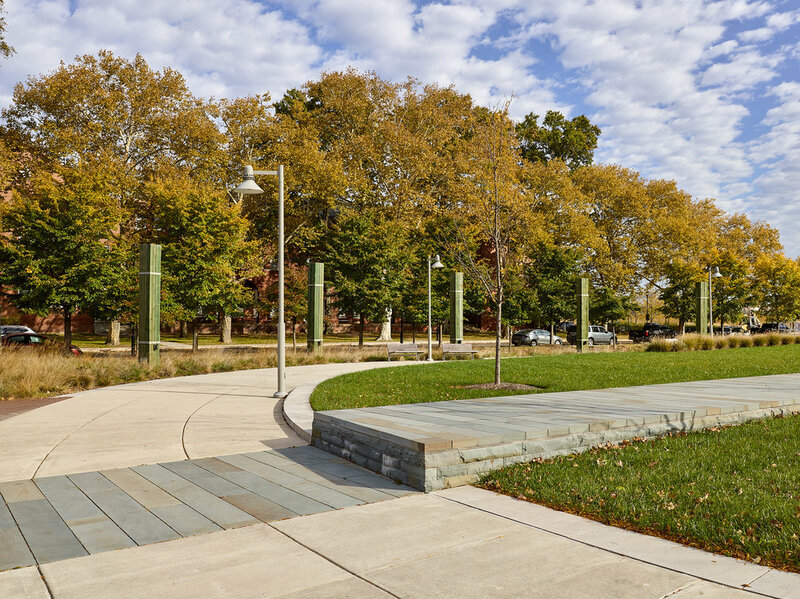 As the initial piece of public infrastructure, the 3.46-acre park set the stage for level of finishes and vocabulary of materials. Formal lawn panels, stands of trees, perennial beds and seating areas support passive recreation and repose for office tenants, with a putting green for those who want to practice their swing. A massive steel pergola evocative of naval architecture curves in an arc around the site for 200 feet, merging the past and present in one landscape. League Island Park, proposed for the 2.5 acre parcel between 11th and 12th Streets on Constitution Avenue, will provide another major amenity within the historic district. Physically located above the original League Island in the Delaware River prior to the expansion of the Navy Yard property eastward, the park is intended to celebrate the islands origins. An expansive stormwater collection system designed as a constructed wetland with native grasses will edge the central mounded lawn oval. A footbridge will lead pedestrians from the perimeter walking paths to the “island”. Decorative wood pilings have been incorporated as lighting features and remnants of pier slabs will provide opportunities for seating. Recycled shells from the Delaware River will be ground and utilized as a soft paving material. This streetscape master plan for a 10-block area within Philadelphia’s Navy Yard Historic District is part of the initial urban design improvements planned to realize the vision of adaptive reuse for this portion of the Delaware River waterfront. Embracing the concepts of green streets to link neighborhoods, urban parks and improve stormwater quality, the master plan has begun to be realized. Improvements include two new parks, Crescent Park and League Island Park, tree lined streets with decorative paving and lighting, and integrated stormwater tree trenches. The project received a design award from NJ ASLA.